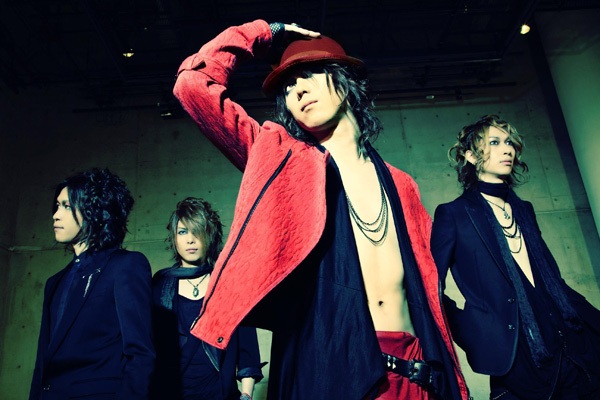 HIZUMI (Vocal), Karyu (Guitar), ZERO (Bass), and TSUKASA (Drum) who make up D’espairsRay formed on 9.09.1999 in Tokyo. They garnered vast attention in the indies scene since their formation with their distinctive sound, unique visual concept, and enigmatic live performances. Their maxi single “Garnet”, which was released in 2003 hit the top spot on the Indies Chart. All of their releases that came after ranked in as well. In 2004, they made their way for the first time to Europe, headlining successful shows in Berlin and Paris kicking start their activities abroad in both Europe and North America. In 2006, they played in a total of 9 countries including Germany, France, England, Italy, Netherlands, Denmark, Finland, Switzerland and North America acquiring tremendous support from an accumulated audience count of 15,000. In August of the same year, they became the only Japanese band to play at one of the biggest metal festivals in Europe, the Wacken Open Air. In 2007, aside from performing at the ‘J-Rock Revolution’ event in Los Angeles, rock fests ‘TUSKA OPEN AIR’ and ‘RUISROCK’ in Finland, they also played headline shows in Spain and Sweden for the first time. 2008 marked their participation in the ‘ROCKSTAR TASTE OF CHAOS TOUR,’ hitting 34 cities in North America and upon their commemorative return to Japan, launched the ‘Taste of CHOCOLATE’ show. During the ‘88-99’ nationwide tour, attendees were given a chance to experience D’espairsRay on a new level. The band will be touring in the Kanto area this coming December, and is scheduled to play a total of 6 shows.